I’m really embarrassed on two counts. 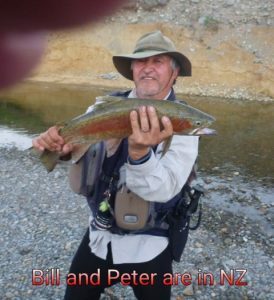 First, that my photo is on the front page of the May 2018 newsletter (I didn’t choose it folks) and second, that my photo is on the front page of the May 2018 newsletter (I’m sure more of you are getting out fishing than just me – for sure I was with Ian and Lyall so I know at least two others are out and about! I’ll get some photos of them into next Burley Line). Meanwhile, in my absence JQ and Luke have put together the May newsletter for which I am very grateful. As so often happens with feast and famine, contribution level was a bit low. I’m sure there are plenty of other stories that you lot have tucked away, I look forward to receiving them in the next few weeks. Meantime, there is some good reading here. This entry was posted in Newsletter on May 1, 2018 by bill. 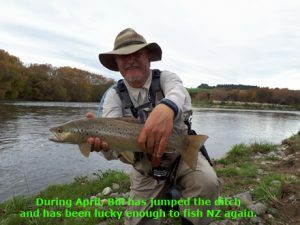 Oops … it was pointed out that there was a typo attributing a 31cm Brown to Mark S. Mark doesn’t catch 31cm fish . It should have read “3 fish to 51cm”. Now fixed. Apologies Mark. Another month where I had feared there would be limited material, but then it arrives. I particularly appreciate the support of Leon who is a regular contributor and this time shares some of his knowledge on innovative ways to use fly tackle. There has been a number of angling related ‘political’ meetings including Snowy Hydro 2.0 and the Koi Herpes virus initiative. Canberra Anglers Association has been engaged and representing the views of our membership. Our co-editor Luke is off jetsetting at the moment so you’ll have to settle for the old format. Hopefully the next issue will be back to Luke’s best. This entry was posted in Newsletter on April 4, 2018 by bill. A little bit slimmer edition this month – more contributions please! A few names only appearing in the articles – aren’t the rest of you fishing ? I hope your summer has gone along well. One wonders whether that huge deluge on 25 Feb has been good or bad for the rivers – certainly the temporary drop in temperature will please our spotted friends if not the natives. 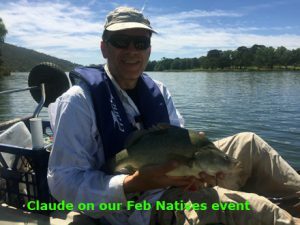 Speaking about natives, was great to hear that some were landed on our Feb Natives event – first time in an age. Well done Claude. Observant readers will note that we’ve reverted back to the old style. Our talented co-editor and reformatter Luke is currently laid up ill. Hopefully he’ll be back on deck soon and I’m sure everyone will join me in wishing him ‘get well soon mate’. DPI’s Peter Turnell and Jim Harnwell stated that trout industry is very important to NSW, for example, in the Snowy region alone it is worth between $70 million to $100 million a year. Whilst some aspects of the trout fishery are doing well other parts need to be improved. Recently the Minister visited Gaden Hatchery and was made aware of some of the issues facing the trout fishery in NSW. 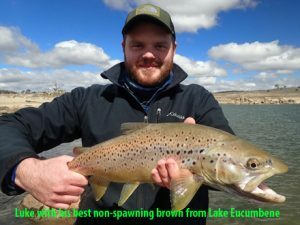 They acknowledged that at the urging of Steve Samuels, the NSW Recreational Fishing Advisory Council (RFNSW) recommended the development of a Trout Strategy for NSW. 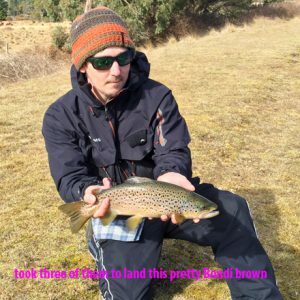 In response to this recommendation, Fisheries NSW representatives, in consultation with RFNSW among others, have developed a framework document which outlines proactive and innovative ways of reversing the decline of the trout fishery in NSW. Fisheries NSW is now organising consultations with anglers and angling groups to then refine the Framework. Meetings are planned for: Armidale on 1 May, Bathurst on 2 May and Jindabyne on 3 May. Attendees of these meeting will be asked to register by 6 April. They will be provided with a copy of the framework well before the meetings. After the meetings an external consultant will pull together and use the outcomes to produce a trout strategy. This entry was posted in Newsletter on March 6, 2018 by bill. Hope everyone had an excellent and safe festive season. Feb 2018 is again a bumper issue. I had thought the quiet period over Christmas/New Year might lead to a lack of material, but reports on club activities late in the year, interesting news from MAS and other angling bodies plus much-appreciated contributions from CAA members means that there’s a lot of good reading here. Lots of good news stories about fish landed, but also (sadly) the impending winding up of CRFA. So much good work especially in the area of habitat restoral, but unfortunately insufficient capability to continue in this vein. Hopefully interclub communications will be sustained in its absence. This entry was posted in Newsletter on January 25, 2018 by bill. This entry was posted in Newsletter on December 12, 2017 by bill. In my absence JQ and Luke have done a great job. Many thanks to Lyall for his contribution from his recent USA trip. I’m embarrassed to grace the front page – more photos needed folk! This entry was posted in Newsletter on November 30, 2017 by bill. 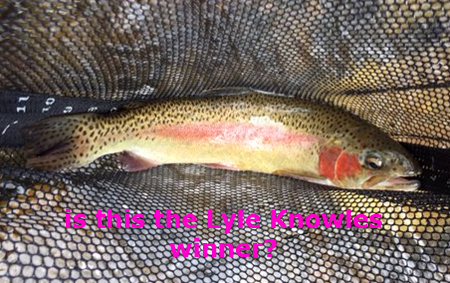 Well, it has been a busy month, what with trout stream opening, Lyle Knowles (back to the Cotter), Nathan doing well with the recent Fly Fishing Australia competition and some of us travelling. All this and more coming up here. A huge issue this month – principally due to the contributions from Jason M, many thanks. This entry was posted in Newsletter on November 1, 2017 by bill. A big issue this month – many thanks to those who have contributed words and photos. 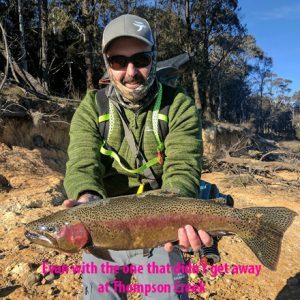 Reports include the casting weekends, including our time on water, Lake Eucumbene continues to produce good fish, Thompsons Creek Dam continues to prove hard to crack. CAA activities in Switzerland and Malaysia grace our pages this month. Gaden Hatchery reports a very successful spawning run. Finally, the RecFish NSW newsletter has brought to our attention a very useful information source on stocking sites. Hope you enjoy it and again many thanks to contributors. Apologies, the ‘Coming Events’ in this issue has the incorrect date for the Lyle Knowles. A decision was taken after the membership card was printed to shift from the one day event on Saturday and instead the event was held Sun 22 Oct. This entry was posted in Newsletter on September 28, 2017 by bill. Wow! Luke C has revamped Burley Line to make it a much more polished newsletter – many thanks for your expertise mate. He has has also taken on the job of assisting Nathan with our Facebook page and social media in general – please assist with being active in both the blog and Facebook spaces. 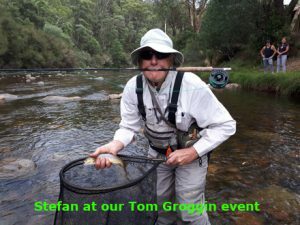 This month is a packed issue with AGM results (new committee – again, well done folks – and trophy awards), lots of fishing reports (thanks again Lyall and Ash – inspiration for many of us and topics for interrogation 🙂 plus the report on our recent event at Bondi Forest Lodge. I hope you enjoy the material and the new format. Please reply to this post with your comments and suggestions. This entry was posted in Newsletter on August 29, 2017 by bill. Thanks go to Jason Q for filling in for me last month. Much appreciate his help here, especially given he’s now a very busy father. I’ll be taking another sabbatical later this year and am looking for a volunteer to try their hand for one edition. It is a lot of fun (especially with generous members providing material) so jump in. JM provides us with extensive notes on our annual event down the coast – recall that this the event that determined the Saltwater Trophy for 2017/18. Luke C and Evan tried a trout site outside our normal range. ‘International traveller extraordinaire’ Lyall introduces us to the Pacific NorthWest – and aren’t we all envious! Claude has extracted from some carefully selected advisors comprehensive advice on the ‘go to’ flies for this region and has kindly shared the results with us all. 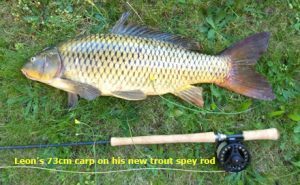 Our local man representing our fishing concerns in so many forums, Steve Samuels, has made a number of important announcements to ‘his list’ and I’ve repeated them here for those not on it. There are some significant items of news impacting on the local fishery. This issue will be a hard act to follow. This entry was posted in Newsletter on July 27, 2017 by bill.